Sorry you are having problems with your neighbor. Hope all goes well. That's a lovely card. You're very creative. LOVE your card Chrissy......wow! And I'm sorry you are having trouble with your neighbor. He must have had alot of pain in his life to be so angry towards innocent dogs! I also wanted to thank you for your kind comments on my blog!!! :) That was so thoughtful! This is adorable! What a great Christmas card! Very nicely done! Love the glitter. I had a dog before and I always carried a bag for picking up doodoo. My dog goes and I go into the lawn to pick it up and a man comes out of the house and says "That stupid dog has no business pooping in my lawn" I told him that I am picking it up, but he didn't want me stepping in his lawn to pick it up either. He loves his lawn so much, he even killed it all a couple of times by over feeding it. He since has tried to make conversation and I ignore him. Ask him if the dog has tried to hurt anyone? If not then ask him, why he would want to shoot a harmless dog. May be he has a reasoning or he is just another idiot. What a terrible neighbour! I hope you get a solution real soon! Your snowman card is super sweet! 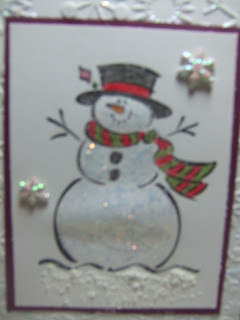 Ohhh I LOVE this glitzy snowman!!!! And yes, stamping is definitely a santiy saver for me!!! 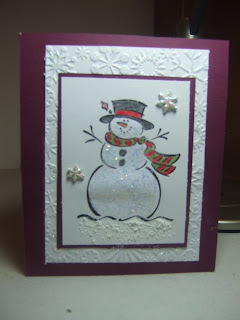 All the glitter and embossing looks amazing Chrissy, I love the idea of using charms as embellishments.